RPA is an acronym that stands for Robotic Process Automation and is a software that uses techniques like screen scraping and others to automate the necessary clerical tasks. RPA could be understood as a business process automation technique or technology which is based on the notion of intelligent workers or software robots. RPA is one of the branches of Artificial Intelligence where it is used extensively, to automate the workflows for their legacy systems. RPA finds its use in many organizations that still rely on age-old legacy systems. Other than this, there are other opportunities where skilled labor are used which could’ve been automated for efficient work completion. 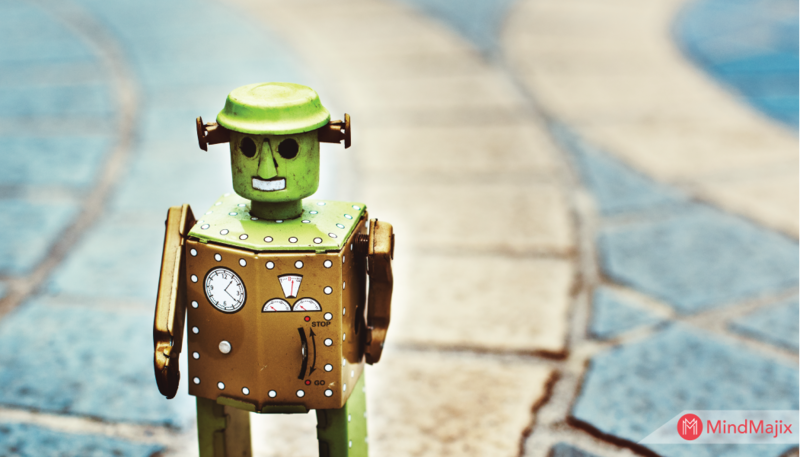 In layman terms if we want to understand what RPA is, it can be broken down to three levels. Automation - Something which can be done by a machine than an individual to save time and also at the same time be effective and efficient. Now, with this understanding, Robotic Process Automation is the art by which a possibility of monotonous work done by an individual be replaced by an automated task performed by robots instead of skilled labor. In other words, enacting a series of steps to complete a meaningful task without any human interaction or supervision can be termed as Robotic Process Automation. Enthusiastic about exploring the skill set of RPA Blue Prism? Then, have a look at the Blue Prism Certification Course. Now with an initial understanding of what RPA is all about, let us now take a deeper look and understand how does RPA actually work. Here, we shall discuss in detail to understand all the nitty-gritty details about Robotic Process Automation (RPA) altogether. RPA bots would be transforming back offices just the same way how the industrial robots transformed the traditional factory floors. RPA bots would be doing the same things that are actually done manually (in the traditional way), but the difference would be that it would all be programmed well beforehand. For an example, if an RPA bot can be programmed to open a certain file, input some data into it and later copy paste some details. Such an RPA bot would require some knowledge either on the programming side but not with RPA. Let us take a look at 4 different ways of setting up an RPA bot to achieve a task as discussed earlier. As discussed earlier, one of the ways to set up an RPA bot is via programming, using a programming language of your choice. But this will require an individual to be technically inclined to achieve this. Programming instructions would be laid out by such programs on how to use/interact with the actual system to get the things done. Since that this requires both programming skills and the patience to go through various scenario fixes, this not suitable for non-technical people. Hence we would not be discussing this any further, but it is an option nonetheless. There are so many vendors who provide the required tools to configure RPA bots with features like dragging and dropping on to simple UIs. Using tools like this, RPA bots can be configured by anyone from the organization as such. Recording all the steps in a complex environment is error prone, and also at the same time can be difficult too. Maintaining these recorders and to make minor changes based on the requirements can get a little cumbersome as these are machine generated. Self-learning bots are fed with the recorded employee tasks and activities and from it, RPA bots can identify any tasks that can be automated. Once these tasks are identified, they would be learning from the repetitive actions using the scraped screenshots and activities. Their learning can be a bit of concern as it totally relies on the scraped screenshots and any minor change to the actual set of recorded activities might have to relearn the process. Once these RPA bots are all setup in a Customer’s environment, there can be an orchestration service that handle the life-cycle of these bots. Blue Prism Group is the Organization who has come with the enterprise Robotic Process Automation software named Blue Prism, which helps in eliminating high risk and low return manual data entry work. Blue Prism is a Robotic Process Automation software product that helps businesses with an agile digital workforce. These software robots can be more cost effective and efficient by following the rule based processes and interact with the business systems just the same way as any regular day user would do. The digital workforce that you create (the RPA bots) are very much secure, reliant, consistent and also scalable. This will relieve the skilled individuals from the mundane and monotonous job and lets them concentrate on much bigger areas of interest. All of this can be achieved by the software robots that we create using Blue Prism, which in turn will be called your digital workforce. As discussed above, Blue Prism is a tool that could be used to automate your business process through presentation integration. It has a built-in support to connect to a variety of application user interfaces ranging from browser-based HTML pages, Windows applications, Java applications and also Mainframe applications that will be accessed via terminals. Blue Prism uses an adapter that will enable interfacing with the external world, called as Visual Business Object (VBO). Each of these VBO implementations use a specific set of operations that are run against an application’s user interface. A organization user (might be a developer or even a business analyst), may use a Blue Prism component called Blue Prism Object Studio GUI to create these objects. None of these processes require writing any code for that. Each of these Visual Business Objects, would expose its own operations to a Blue Prism process and in order to create one, a user would use Blue Prism Process Studio. The steps for the process can be defined by the user graphically and each of these steps would then be invoking the necessary VBOs to talk to your business application. All of these objects, the VBOs, the processes and all the information related to these objects are finally stored on a SQL Server database. Control Room is the module that the business users can use to start or view the information related to Blue Prism processes. System Manager is the module that allows users to configure additional users, allows to perform management related tasks and also allows to view audit logs. 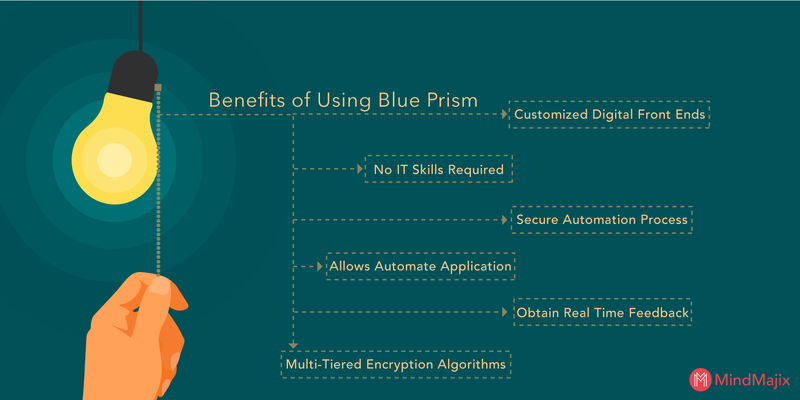 Blue Prism provides encryption, load balancing and features like audit. With its latest version (v6), it extends its support to Amazon AWS Cloud and Microsoft Azure. What is a Object Studio? 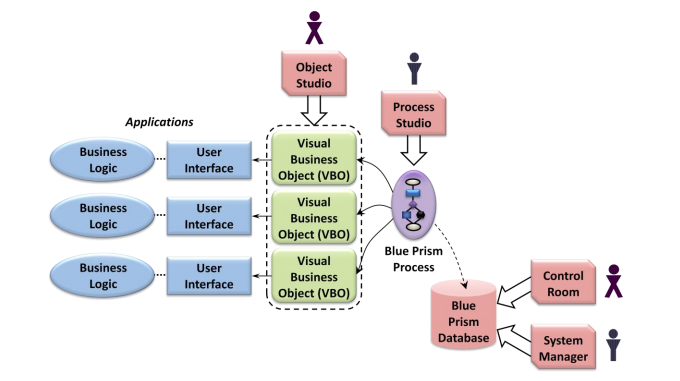 Blue Prism Object Studio is the module where you get the chance to create a Visual Business Object, generally goes by the acronym VBO. Visual Business Objects are created just so that they can interact with other business applications. What is a Visual Business Object? It is a standard library provided by Blue Prism in order to enable communication with a specific application’s user interface. This in specific is used to expose the elements of the target application’s user interface using the VBO’s connector in turn. There can be one or more than one pages involved and each of these to implement the whole operation or a part of the operation which a VBO can later perform. Java connector to work with user interfaces with technologies like Swing, AWT, Applets or Oracle Forms further based on the JVM used. Mainframe connector to connect via the terminal emulators from vendors as like IBM, Micro Focus, Attachmate etc. Citrix connector to connect to application’s user interface via Microsoft Remote Desktop Services or Citrix XenApp. Logic of a Visual Business Object (VBO) is implemented within one or more pages. 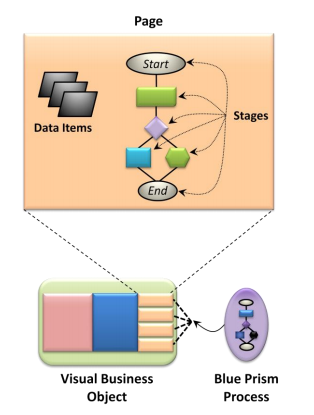 The following figure shows how each page contains the required operations which are nothing but a set of stages holding the data items used by that operation. 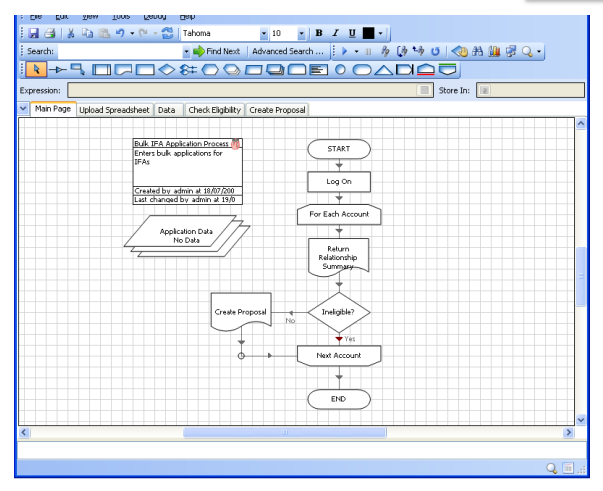 Blue Prism Process Studio will be similar to a flowchart and it will be the actual area where a process be created. There are other features like Control loops, logic, variables and object calls possible than what are available in Object studio. These can all be sequenced and tested cleanly inside a business flow flawlessly. A process can further be understood as a depiction of a human user. It can also be a sequential set of steps that needs to be carried out with the interaction from several other applications. What is a Blue Prism process? 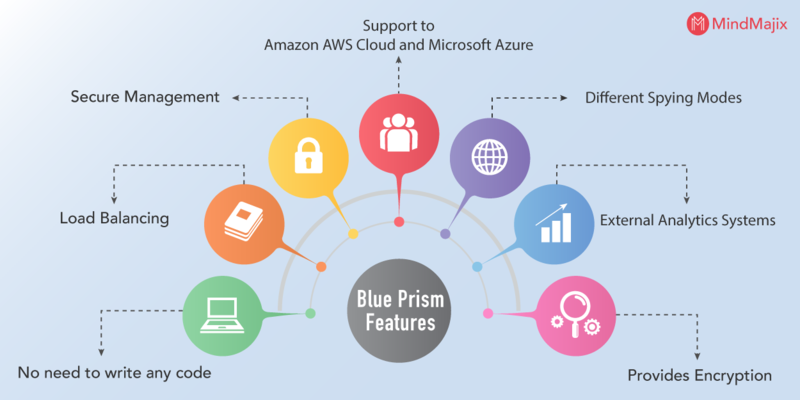 As discussed above, a Blue Prism process can be understood as a depiction of a Human user as it accesses applications through their respective user interfaces as a regular user does. To be very precise, to some extent a Blue Prism process can be understood similar to that of a VBO. Just the way we have seen in Object Studio, a process has its own page where the analyst can group on logic basis. Process Studio just like Object Studio, allows its users to create some logic graphically. Process Studio also provides debugger tools to allow users to step through processes and understanding the logics better. The biggest challenge that someone might face is the business processes being set with the proper values. Hence the feature from Process Studio to keep track of the history of changes that were made and made by which individual, to recover the last working state without any hassles. There is also another issue that analysts face while working with business processes - track of what happens when these are executed. Blue Prism process can be tested to see how much percentage of chances the process is covering based on the real time data, which helps them tweak the process a little bit - should there be a need to do it. Immediate feedback can be achieved and also very helpful in making the business process more effective and efficient. In order to implement a RPA system in any given organization, there is a need for us to have a real process which does the actual tasks and it also needs to work along with a set of external applications. Business Object is a diagram which is different from the actual process diagram that is nothing but an interface to the application. Business Object will never be configured in the Blue Prism Process Studio but will be configured on an environment called the Blue Prism Object Studio. The main objective of a Business Object is to provide an interface to a business application. A Business Object will never be exposed to the Control Room module and it will never be running on its own. It will always be used along with a Process. UiPath is yet another strong player in the RPA domain competing with Blue Prism neck on neck. They have already been providers for robotic process automation solutions to organizations as like Ernst & Young, SAP, JPMorgan, Accenture, Deloitte, BBC etc. Pega had recently acquired Openspan RPA software organization to complement their already existing BPM (Business Process Management) platform. This makes Pega an ideal choice for Organizations who would no longer have to choose between Automation Vs Digital transformation. Robotic Automation & Intelligence is the offering provided by Pega in the RPA domain. Automation Anywhere is another vendor in the RPA domain who has already been providing robotic process automation solutions to clients as like KPMG, ECM2, Genpact etc. Automation Anywhere Enterprise is the product that Automation Anywhere provides. WorkFusion is yet another organization which is committed to develop AI based software products to bring about transformation at work. Some of the key areas where WorkFusion concentrates are Cognitive Automation, Artificial Intelligence and Robotic Process Automation. WorkFusion is already partnered with Wipro, Virtusa, FIS, HCL and etc. With the other tools discussed in some detail which fall in the same space of Robotic Process Automation, let us now dedicate some time in understanding how these can outperform each other on various aspects. As there are multiple factors that we can evaluate each of these products, we have tried to keep it to bare minimum but details intact. With no further delay, we will take a look at the following table which provides the differences amongst these RPA tools. How easy or hard is the learning? Comes with a user friendly visual designer explaining stuff on the go. Comes with a user friendly visual designer explaining stuff on the go. You can obtain real time feedback from Control Room module, which will help you get a detailed insight into your digital workforce. Customized digital front ends provide an easy way to integrate front office agents and the back office bots in improving humans and bots interaction. In this article, we have discussed in detail about the core concepts of Robotic Process Automation (RPA) and later we discussed in detail about one tool named Blue Prism. It is a full blown solution to all your automation requirements. We have discussed in detail on the usage of Process Studio and Object Studio respectively. We have gone through some of the advantages that Blue Prism brings to the table and also discussed about the tools that fall into the same space. Also, we have discussed in detail about their differences and how each of these solve the automation requirements in different business areas. Explore Blue Prism Sample Resumes! Download & Edit, Get Noticed by Top Employers!Download Now!